I made homemade pita bread about a year ago, and I too won’t go back to store bought. OMG I’m totally trying this! I think soft, fresh pitas sounds wonderful – considering I ate a hard one for lunch! Thanks for sharing! I can never thank you enough…but I will try. Thank you so much for sharing, I love making homemade pita bread and this whole wheat version looks great. 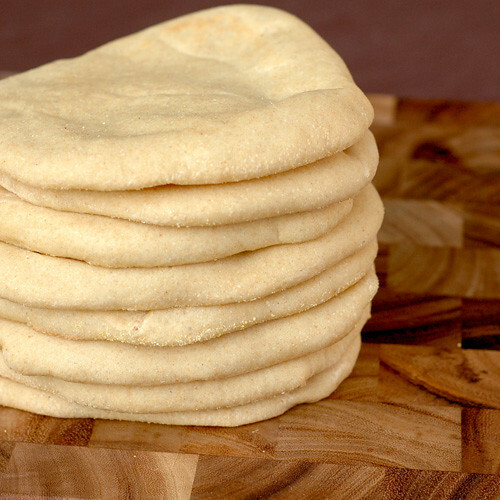 a soft, fresh pita sounds divine! Those look amazing! You did fabulous job! Yaaay for whole wheat! Thank you for sharing…I can’t wait to try this! These look so soft and fluffy! I love that you added whole wheat flour too, I have been doing the same lately. I make mine in the BBQ grill where the temperature can get to 600F and it has worked great. on January 6, 2011 at 8:48 am | Reply tobias kocht! I was just looking for such a king of Pita to accompany an Indian dish. Thanks a lot. I think the pita consumption in this house will quadruple. I cannot wait to try these!! I make pita’s at home as well. The trick that I have learned to getting the pita’s to puff is to only bake one at a time and make sure you’re using a preheated baking stone. Each time I put more than 1 pita in the oven at a time, they won’t puff or won’t puff all the way. If I put just 1 in then it works! Not sure if there is any real reasoning behind it but it’s what always works for me. Thanks for the tip about just putting one in at a time. I did use my baking stone, however I was baking three at a time. I will try just one next time. Although, I did love them the way they turned out. I made these tonight to go with the hummus I’ve been craving. They turned out fabulous! Mine were darker than yours but I had to use molasses because for some reason I was out of honey. (How does that even happen? You’d think I’d remember throwing away the old honey container…) They poofed perfectly! I did them two at a time on my pizza stone. Two minutes on one side and one on the other. My only complaint is that mine aren’t nice and round like yours. >.< They look more like misshapen amoebas. Guess I'll just have to practice. I am so glad that you enjoyed them! I think that they are fabulous!